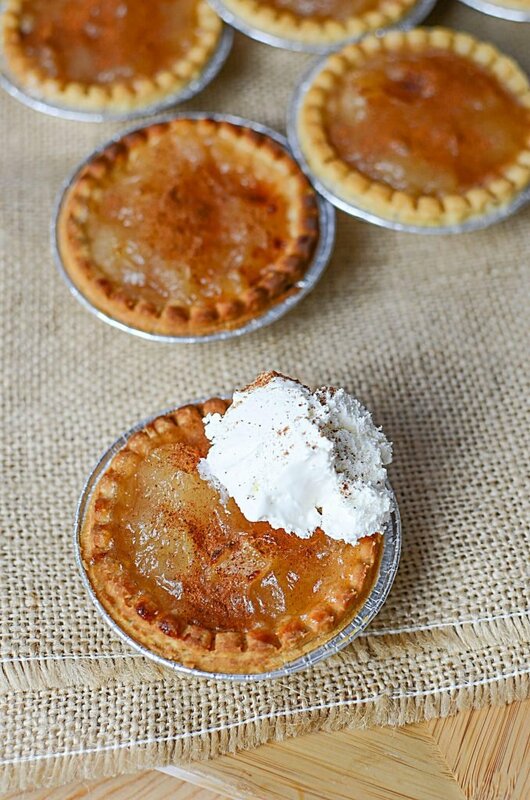 What’s better than apple tarts? MINI APPLE TARTS!!! Seriously though, there are a lot of different recipes for mini tarts out there, but there is nothing really as classic (and yummy) as good ole’ Mini Apple Tarts! It’s like your own personal apple pie, plus they’re made in a flash with the Ninja Foodi!! Now, let’s not hate on the fact that we are using commercially prepared products here. Yes, it’s nice to have a homemade apple pie filling or a homemade tart shell, but sometimes our time constraints in life don’t make it a reality to prepare these foods. There is nothing wrong with using a bit of store-bought help! Being all about the simple means making things simple for yourself, and/or with simple ingredients, and just overall, having a simple life to be able to enjoy all the other things that make our lives worth living. That being said, if you have the time and inclination, by all means, make them from scratch and PLEASE share the recipe below in the comments! Wait, What’s a Ninja Foodi???? My dear reader, a Ninja Foodi is possibly one of the coolest cooking appliances on the face of this earth! It’s a pressure cooker, air fryer, steamer, dehydrator, and you can crisp, brown, AND SLOW COOK in it!! It’s truly amazing. I wrote a more detailed post about it here if you’d like to learn more about it! 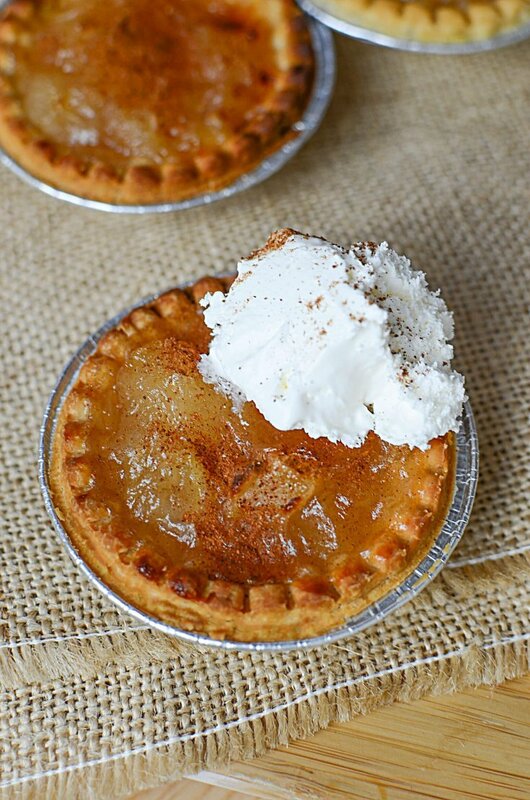 How Do I Make These Delicious Foodi Mini Apple Tarts? It really couldn’t be simpler. The most important part is that you watch the tarts as they are air frying. They brown pretty quickly, so you can’t be going and talking on the phone about the latest Brad Pitt flick with your best friend Sharon and forgetting all about these little apple cherubs in the Foodi. Where Can I Serve These Little Foodi Mini Tarts? You can also probably tell that this basic recipe would be awesome with different fillings! I think I’ll try making some cherry ones, and ooooooh.. maybe even blueberry mini tarts would be fantastic! (Kinda like my blueberry strudel pie I made that one time.. ohhhh lawd it was amazing!) Also, I thought I’d mention, if you’ve made your pie filling from scratch, and you have some extra apples hanging around, I also have this super sweet little Apple Pecan Croissants with Butterscotch Schnapps dessert that I made. THOSE might not look fancy, but they definitely have an adult flavor to them. Wooweee they’re good! Well, I hope you like this little cutie mini apple tart recipe made in the Ninja Foodi! What other flavors would you like to try? Let me know below!! Thanks for stopping by The Salty Pot today, and I hope you have a wonderful day!! 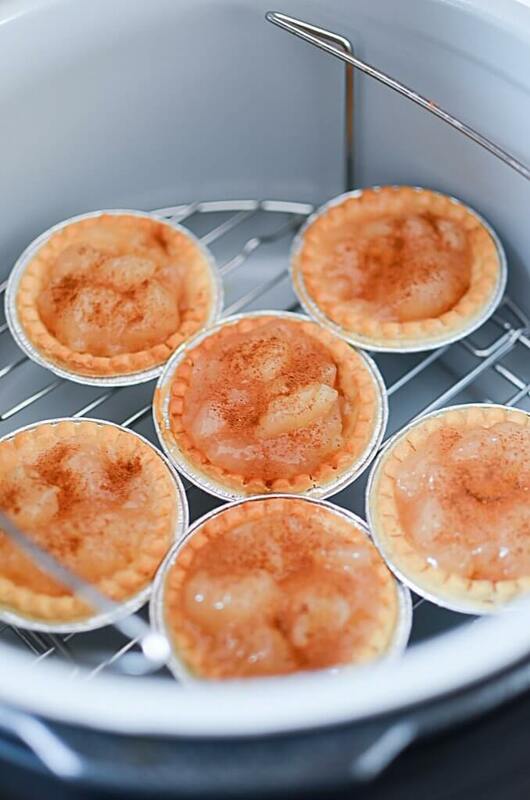 Warm and sweet, these cute little Ninja Foodi Mini Apple Tarts are like having your very own apple pie! All the flavor, just less calories! 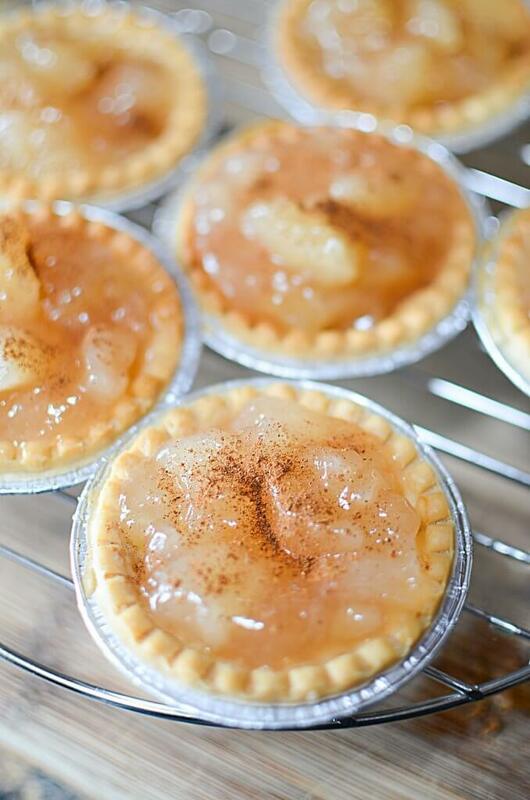 Best of all, they're a snap to put together, and the little ones will ADORE these individual baby apple pie tarts! 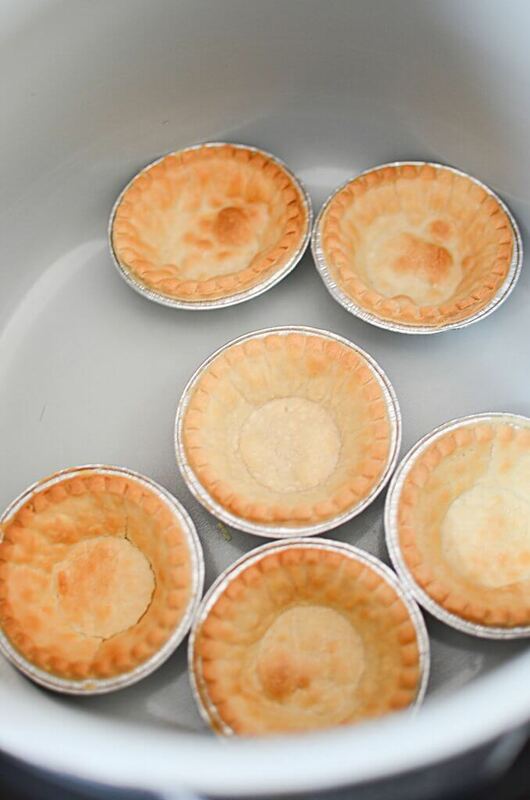 Place the tart shells in the bowl of the foodi. Air crisp them for 5 - 7 minutes on 400. My suggestion here is to keep an eye on them as they will bake very quickly and get brown fast. When they are baked through and starting to get some color, remove and let cool. While the shells are baking, cut down the slices of apples in the filling if they are long. You want small peices of appl in this filling. Add the spices to the apple pie filling and mix well. 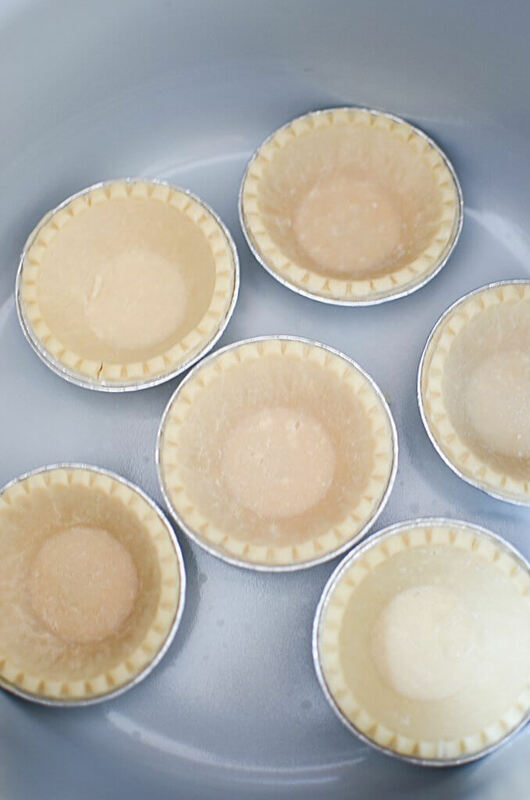 When the shells have cooled, divide evenly and spoon the filling into each of the tart shells. Air crisp the tarts again until the tops of the filling is caramelized and the tarts are a nice golden brown. Remove and let cool slightly. Dollop with whipped cream or ice cream. Thank you for this wonderful desert recipe for my new Ninja Foodi. I will be making these using various pie fillings. I assume they would be good to make ahead and freeze for a last minute desert. One thing. I notice your recipe mentions Air Fry the tarts in Step #1 and #6. Since the Foodi doesn’t have an Air Fry feature, I am assume you are referring to the Air Crisp mode. 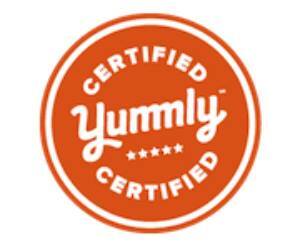 You’re SO welcome for the recipe Sharon, and thank you so much for taking the time to comment! I also want to try a few different toppings and see how they go! 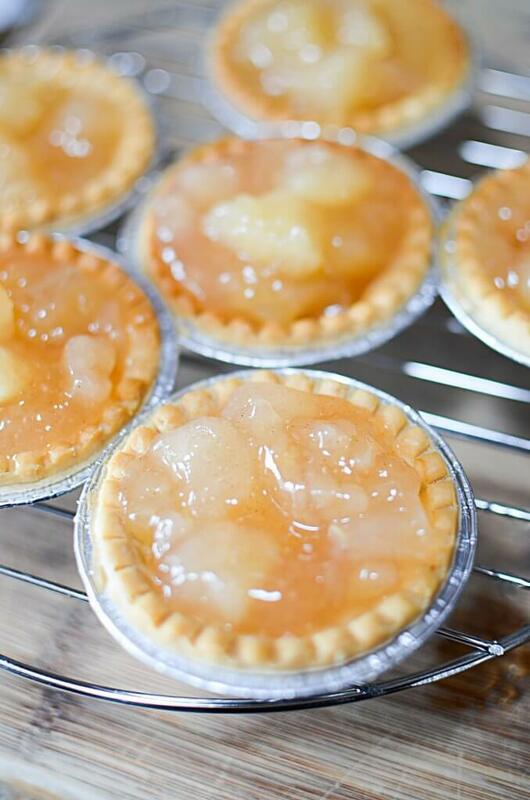 These apple tarts were divine and so easy! Yes.. you’re absolutely right, I need to go and change that terminology! Thank you for bringing it to my attention! Would love cherry or possibly chocolate meringue. Thanks for the great ideas Cyndi! !